Encompass Health’s ability to adapt to changes, build strategic relationships, and consistently provide high-quality, cost-effective care positions the Company for success in the evolving healthcare industry. 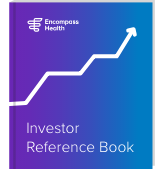 Encompass Health is a leading provider of inpatient rehabilitation and home-based care committed to delivering high-quality, cost-effective, integrated care across the post-acute continuum. Rehab IconA circle with an arrow surrounding an icon outline of a person. We are the largest owner and operator of inpatient rehabilitation facilities. We are the 4th largest provider of Medicare-certified skilled home health services and a top 25 provider of hospice services. Through this video, you will experience Encompass Health’s innovative approach to connected care as we follow the patient journey to superior outcomes.